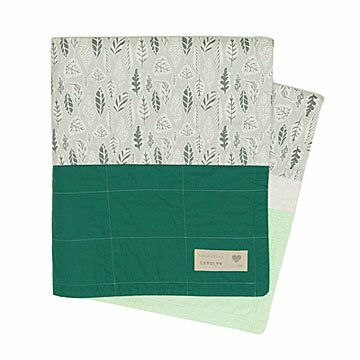 Craft an instant heirloom for any new arrival with this easy quilting kit. Did your great grandmother make that? Smile quietly to yourself knowing it was you, your sewing machine, and this baby quilt kit. Inspired to learn to sew when her son was born, Ann O'Connell created this kit that lets you make an instant heirloom worthy of any endearing layette. It includes pre-cut fabric, batting, thread, tools, a customizable label, and easy-to-follow instructions. You just need a sewing machine, washing machine, iron, scissors, and about six hours to make a cozy quilt featuring your choice of "falling leaves" or "birthday sprinkles" patterned fabric. The kit makes a unique, DIY gift for expecting moms, grandparents, and aunts and uncles who want to make something extra special for the new baby in their lives. Designed and packed in Colorado with fabric from Korea, Thailand, Indonesia, and Japan. Inspired to learn to sew when her son was born, Ann O'Connell searched for a simple way to try quilting without having to invest in all the supplies. Her quilt kits were the answer. They let curious quilters easily make an heirloom-quality baby quilt without having to buy all the expensive materials or figure out how to follow complicated patterns. In her past life, Ann was a lawyer and real estate broker. She resides in Boulder County, Colorado, where she enjoys the mountains and outdoor adventures.